Local elections aren’t about Westminster, or Brussels. They are about issues that are much closer to home. On May 2nd, you will be asked to decide who runs the essential public services that we all rely on. You will be asked to choose someone to represent you in the Town Hall, someone who will speak up for the residents of Adlington and Anderton. Paul Lowe lives in Anderton with his wife and two children. They love being part of such a caring and vibrant community and as this is why Paul is standing for election this year, to give this unique corner of the Borough a genuine voice; a strong and passionate one that is determined to hold Chorley’s Labour Council to account over things that matter to you, like how much Council tax we pay and how that money is spent. In particular, he will campaign tirelessly for more resources and fairer funding for Adlington and Anderton. 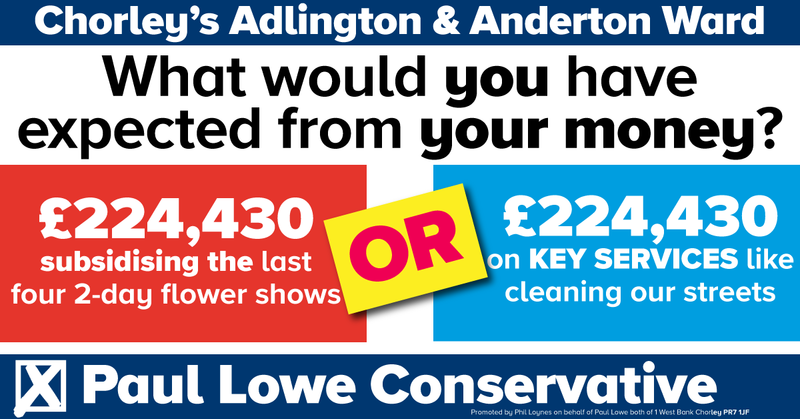 Paul Lowe is the Conservative choice for Adlington and Anderton in 2019's elections. Paul also stood in last year's local elections.